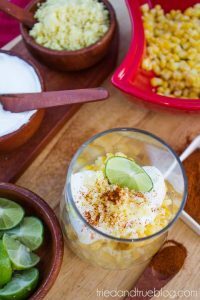 A healthier take on the street food staple, Elote en Vaso! Easy to customize to make vegan. Following the instructions, cook and drain the corn. Add butter, mix, and allow to melt completely. Place in a covered serving dish until ready. Place the cauliflower, nutritional yeast, lemon juice, and salt in a food processor and pulse until you have the consistency of fine crumbles. If you mixture is too liquidy, you can squeeze the "cotija" through cheesecloth to remove some of the moisture. Stir lime juice and salt into the greek yogurt to make the "crema." Add a 1/2 tsp of water if the consistency is too thick. To serve, place all ingredients in separate containers and allow your guests to create their own cups. ¡Buen Provecho!